There was a conference of the American Society of Human Genetics held in Salt Lake City in 2005. One of the exciting topics at the conference was the correlation between genes and brain development. Regrading this correlation, Dr. Galaburda from Harvard Medical School hypothesized that there are probably a dozen genes involved in dyslexia that affect the migration of neurons in the brain. The discovery of a genetic link should help overcome the stereotype that people with servere reading problems are stupid and lazy. A Yale geneticist, Dr. Jeffrey R. Gruen, spoke about the gene DCDC2 which affects reading centers in the human brain where DCDC2 is active. The brain of one out of every five dyslexics tested makes the protein from this gene which is less active than normal. The DCDC2 gene helps the circuitry that underlies reading. In addition, there is another gene called Robo1 that affects the axons in the brain which allow the two hemispheres to communicate with each other. When the activity of the Robo1 gene is reduced, it affects dendrites that are involved in reading. This means that the ability to process the fast sounds of speech is reduced, which contributes to decreased reading proficiency. Neuron: A nerve cell. The fundamental unit of the nervous system, having structure and properties that allow it to conduct signals by taking advantage of the electrical charge across its cell membrane (1). 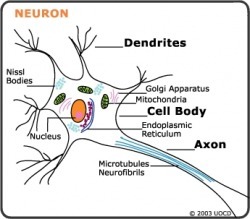 Dendrite: One of usually numerous short, highly branched processes of a neuron that convey nerve impulses toward the cell body (1). Axon: A typically long extension, or process, from a neuron that carries nerve impulses away from the cell body toward target cells (1). This article seems to focus more on the social impact that the discovery of these two genes would have rather than the discovery's scientific impact. Scientifically, this discovery will lead to a better understanding of how the neurological pathways in the brain work, especially when related to dyslexia. This can also lead to further discoveries of other genes the can affect word processing, reading, and spelling. While these are exciting topics, the article deals with another interesting topic which those engaged in the scientific pursuit may sometimes miss. It focuses on the stereotypes and stigmas attached to those for whom reading is a challenge. The common stereotype is people being perceived as lazy or stupid because of their reading problems. The problem with this statement is that people who cannot read are not less intelligent then people who can. The thing is, the traits associated with problems of reading may in fact be genetically linked. The difference is in the development and functions in the brain of a person who is dyslexic compared to that of a person's brain who is not dyslexic. There are three general areas involved in reading which are the Broca's area, Parieto-temporal, and occipito-temporal. A person who is dyslexic lacks the parieto-temporal and occippito-temporal areas. This is a perfect example of scientific information that the article lacks that could strengthen its social arguments, of how the article needs to have a better representation of the scientific side. This can also be seen in the fact that the author talked about having a genetic test for children to see if they have a predisposition to dyslexia by the year 2006. It is already 2008 and an accurate one is still non-existent. The author's lack of demonstrable scientific knowledge hampered the impact she might have made in reporting this important scientific milestone whose ramifications could be far reaching in both the scientific and educational worlds. One year after scientists discovered a gene whose flaw contributes to dyslexia, two more such genes have now been identified. The findings, described yesterday in Salt Lake City at a meeting of the American Society of Human Genetics, support the idea that many people deemed simply lazy or stupid because of their severe reading problems may instead have a genetic disorder that interfered with the wiring of their brains before birth. "I am ecstatic about this research," said Dr. Albert M. Galaburda of Harvard Medical School, a leading authority on developmental disorders who was not involved in the latest discoveries. The findings, added to last year's, mean that for the first time, "we have a link between genes, brain development and a complex behavioral syndrome," Dr. Galaburda said. As many as a dozen genes are probably involved in the disorder, he said, with each playing a role in the necessary migration of neurons as the brain's circuitry develops. Researchers said a genetic test for dyslexia should be available within a year or less. Children in families that have a history of the disorder could then be tested, with a cheek swab, before they are exposed to reading instruction. If children carry a genetic risk, they could be placed in early intervention programs. "Reading ability is a proxy for intelligence in American culture," said Dr. Sally E. Shaywitz of Yale University School of Medicine, a pediatrician who is an expert on dyslexia. The findings should help overcome stereotypes and get children the assistance they need, she said. One of the genes newly linked to dyslexia is called DCDC2. It is active in reading centers in the human brain, said Dr. Jeffrey R. Gruen, a Yale geneticist who described the discovery at a news conference yesterday. Large deletions in a regulatory region of the gene were found in one of every five dyslexics tested, making it less active. Fluent readers and dyslexics alike have the protein made by this gene, Dr. Gruen said, but it is less abundant in dyslexic brains. The function of the protein is not known, he said. Rats also have the DCDC2 gene, so it should not be misconstrued as a spelling or reading gene, Dr. Gruen said. Rather, the gene supports the circuitry that underlies reading. When it was perturbed in unborn rats, he said, neurons migrated shorter distances, undercutting early brain development. The second gene, called Robo1, was discovered by Dr. Juha Kere, a professor of molecular genetics at the Karolinska Institute in Stockholm. It is a developmental gene that guides connections, called axons, between the brain's two hemispheres, Dr. Kere said in an interview. When the gene's activity is reduced, the number of finer connections, called dendrites, is reduced in brain areas involved in reading. "You get the right signals going, but they do less well in terms of rapid processing," Dr. Kere said. Many dyslexia experts believe that reading problems stem from an inability to process the fast sounds of spoken words. Sandra Blakeslee (2005, October 29). Scientists Tie Two Additional Genes to Dyslexia. New York Times, p20A. Retrieved February 10, 2009, from ProQuest Newsstand database.